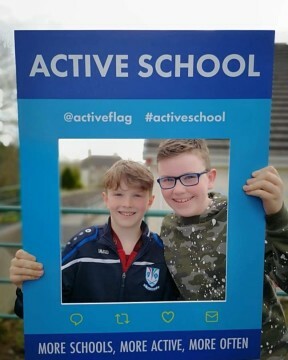 This year our school has been working on renewing our Active School Flag. We started this project by doing an audit of all the active activities going on in the school. Next we elected an active schools committee. 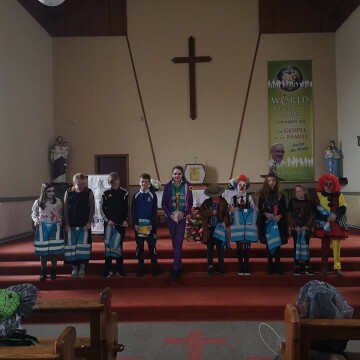 The committee is made up of pupils from the school. 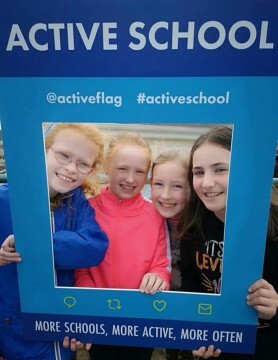 The committee’s job is to plan active activities for all the pupils, communicate these initiatives to the school community and lead by example. We are very lucky to have fantastic, hard working pupils on this committee. 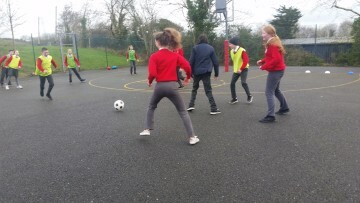 Read on to find out more about the fantastic initiatives we have undertaken to ensure we are physically active everyday at school. We chose our slogan by taking all of the entries and voting on them. It was a very hard decision but eventually we got the slogans down to a final few. Again, we had to vote. The biggest problem was the amount of great entries making the decision immensely hard. Congratulations to Alan and well done to everyone who entered. We were pleasantly surprised to all the hard work that was put into all of the entries. 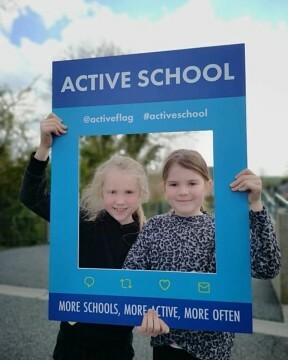 From everybody in the Active Schools Committee, thank you for taking part in the competition, and a BIG thank you to all the teachers for helping to make this happen. We are looking forward to more fun activities in the future. Our Active Schools Slogan Winner!! 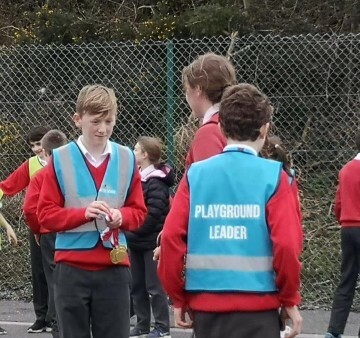 The role of playground leaders is to play games with younger children at break times. 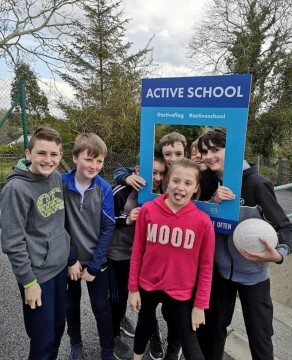 Our Playground Leaders are ten pupils from fifth and sixth class who are in the Active Schools Committee. 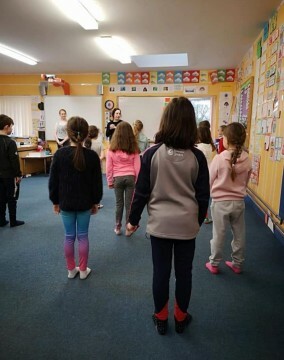 These pupils take it in turns –two at a time- to play with the junior infants; senior infants; first class and second class. The Leaders do a great job in teaching the younger children how to play playground games. The Leaders also model how to include everyone so no one is left out and everyone plays nicely. 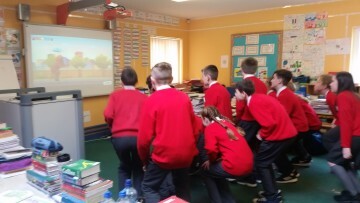 Go noodle is a fun way for kids to get active at school with friends. Many people have used Go Noodle and had positive results for children! 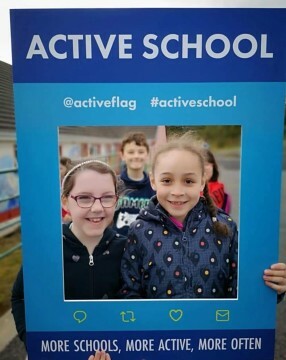 All of Inch National School have been using this website and all pupils enjoy it because it is educational and teaches kids how to get their sixty minutes of exercise every day. Most teachers usually use Go Noodle on a daily basis to relieve kids from that tough schoolwork. 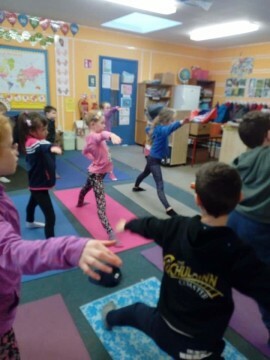 There are so many ways to get active on Go Noodle; too many to count like star jumps, stretches, jogging on the spot etc…Sometimes, even the teachers join in the fun because it is that good. HAVE YOU TRIED GO NOODLE YET? JUMP IN THE FUN TODAY! 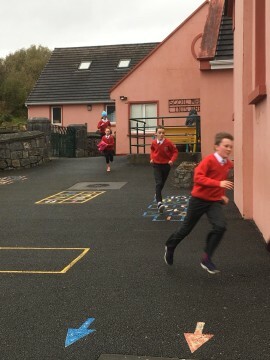 The daily mile is an all school activity. We run every day in the morning. 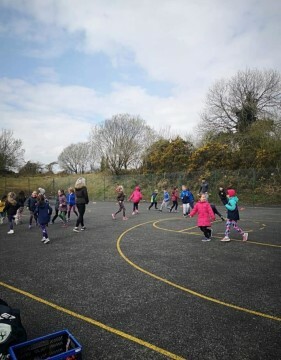 Infants to second class run on the basketball court while third to sixth class run laps around the school. All classes run as many laps as they can for ten minutes straight. If a child is tired, they can walk or slowly jog. 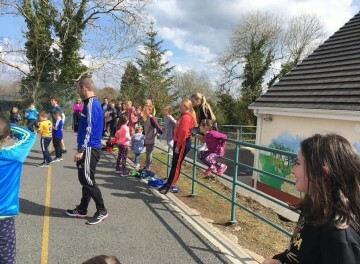 All students take part in the daily mile. Teachers encourage the pupils run and to keep going. 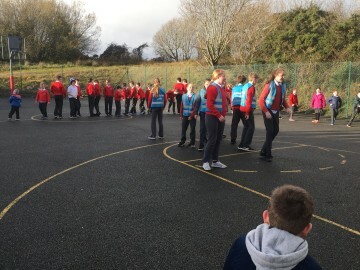 The playground leaders and the active school committee lead the warmup for Third to Sixth Class while Miss Cahill or Mrs. Gleeson lead infants to second class. All children enjoy this activity and we are amazed at how fit we are becoming with each passing day. As we are getting so good at the Daily Mile, we have decided to run around Europe. Mr. Mc Kenna has put a map of Europe on out Active Schools’ notice board. We have identified all the capital cities throughout Europe as well as the distance between each. Our total distance from the Daily Mile is calculated and indicates how far we have run towards each capital. So far, we have accumulated enough miles to reach Dublin and London. Next stop….. Paris! 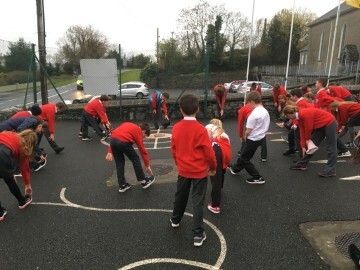 The Daily Mile is also a great way to start the day and get our minds and bodies in the zone for learning. This initiative involves pupils completing a piece of Active Homework each evening. The homework can be recorded in our Active Homework diaries. We love this kind of homework as it beats regular homework hands down! On wet days we enjoy physical activities. 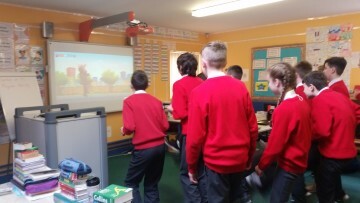 One of the things we enjoy doing is Go Noodle. Go Noodle is a dancing activity everyone enjoys. This activity really lightens the mood in every classroom. This is an exceptional activity for people who do not particularly like sports. Physical Education plays a big part in a student’s wellbeing and health. 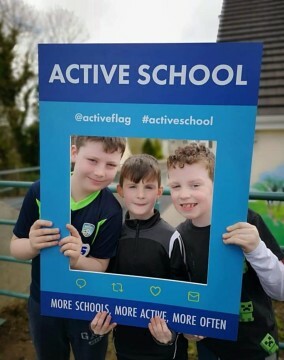 Junior Infants to Sixth Class enjoy P.E. and it is a time to look forward to. 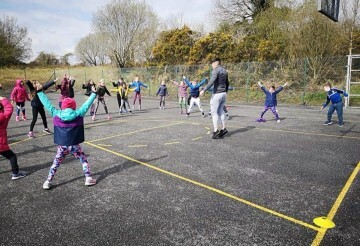 Junior Infants to Sixth Class participate in different strands in P.E. including; athletics, dance, gymnastics, games, outdoor and adventure activities and aquatics. The strand units are the same for each class. 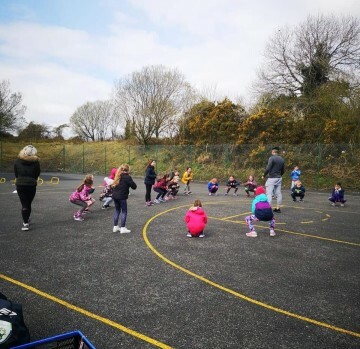 However, the Junior and Senior Infants would have more basic activities compared to the older classes and the Fifth and Sixth Class would have more complex activities compared to the younger classes. We also do yoga with Rosie where we do lots of different poses. 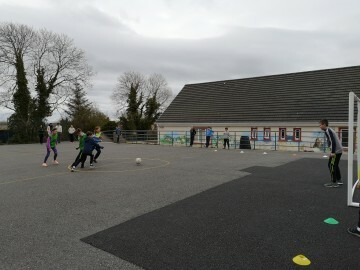 We do soccer training with the FAI and Denis Hynes, and hurling with Ann Mc Mahon. Every student enjoys this type of exercises. In conclusion P.E. is a widely enjoyed subject among all students. 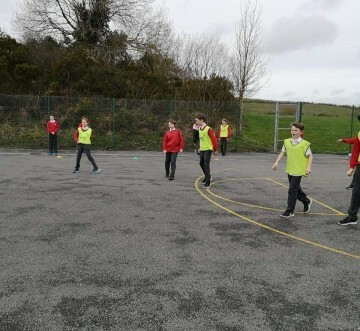 During the past few weeks, third to sixth class have been taking part in a lunchtime soccer league. 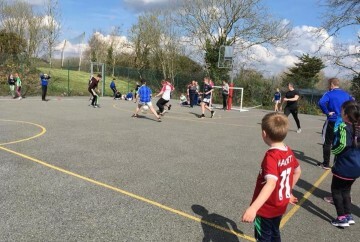 The league consisted of six teams of six people and eighteen games were played. Team three and six were playing in one of the semi – finals. Team Four and Team One played in the second semi – finals. Our final teams were Team Six and Team Four. 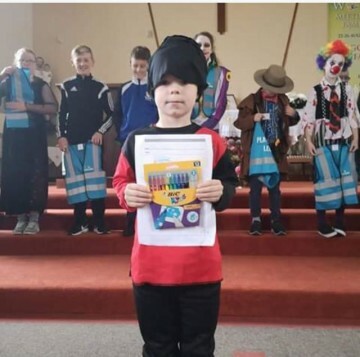 The Team 6ix players were Tom, Dylan K, Donnacha, Amy, Odhran, Scarlett and Ellisha. The team four players were Ava, Gareth, Sean K, James K, Niamh and Jenny. 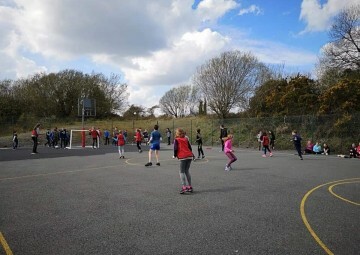 The final match took place on Tuesday the 5th of March 2019.The entire school came out to watch the game at two to three. It was an intense match. The math was twenty minutes a side. Both teams were great. In the end the match went to penalties. Many penalties were taken but only one was scored. The winning penalty was scored by Ava Mc Guane who also won player of the match. Team four won the league. Sean Kelly won player of the match. On team six Dylan Killen won runner up of the player of the match. It was a great game and both teams should be very proud. 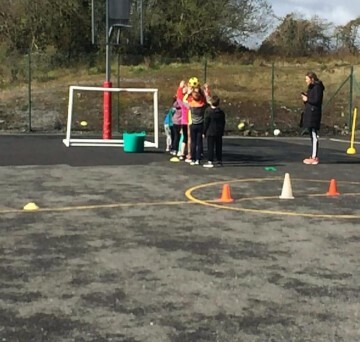 This soccer league was great fun for everyone who took part and we all really enjoyed it. It was a great way to stay active at break. We thank Mr Mc Kenna for coming up with this idea. We also thank are teachers and staff at our school for being so supportive of the idea. 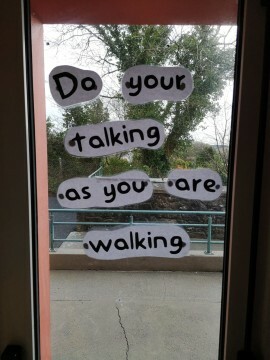 Do Your Talking as You’re Walking! Do your talking as you’re walking is a motto to get children to be more active at break and during daily mile. The idea is for children to not stand around and talk, but walk/play and talk at the same time. It means that children can be active not just at P.E, but at break time too. 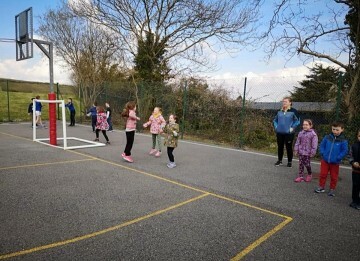 This has been a great success and has got the pupils of Inch National School enjoying exercise. Mr. McKenna came up with this idea for us to do. 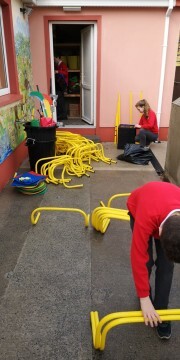 This idea is helping the children a lot and our school is becoming more active every day. Around the school we have plaques on the walls, marking our active walk way. These plaques are green so they stand out on the wall. On the plaques is a person walking. 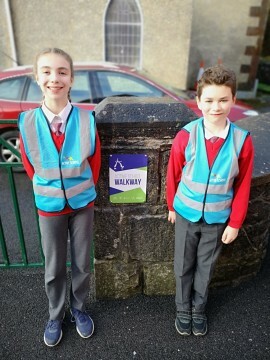 The active walk way is for the daily mile and for if children want to walk laps of the school at break times if they don’t want to play soccer or other games. This walk way encourages children to become more active during breaks. Students follow the plaques and know the correct way to go. This also ties in with “Do Your Talking While You’re Walking”. 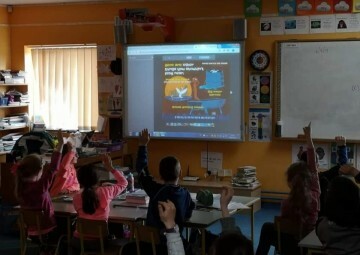 This programme is already being used by all classes in the school. 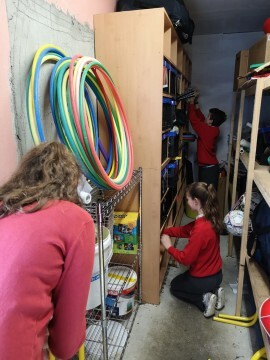 Completing our Equipment Audit and Store Tidy Up. – yoga with Rosie McMahon. Everyone in the school really enjoyed all the different types of physical activities we have done and are doing. To keep parents involved we gave out a parent questionnaire to all the parents in the school. This survey had a number of questions about their child and P.E. On the second page there was a student questionnaire this includes another set of questions for pupils to answer. Students receive P.E. homework after a P.E. class. This homework is separate to active homework and students should do as much as they are able to do. In some classes, students receive a small laminated card that tells them what to do for the P.E. homework. For example, the students might receive a card with do 65 Jumping Jacks or do 2 minutes of Star Jumps written across it. P.E. homework is a way to keep students fit and healthy when they’re at home. The Importance of Physical Activity. Physical Activity is extremely important because it keeps your mind and body healthy. Without physical activity you would become unfit and unhealthy. 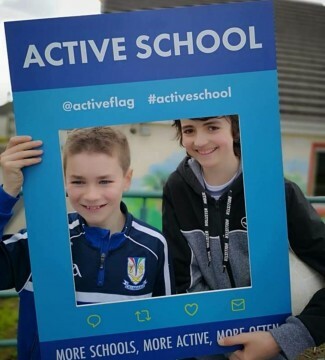 Here at Inch National School we take being active very seriously. We believe that everyone should be active every day. For example, we do a run around the school every day for 10 minutes we call the daily mile. We also do go noodle which is a fun programme which children can take part in by simple following the videos on You Tube. 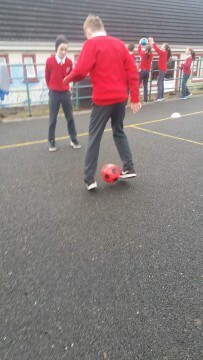 In P.E we have been doing soccer, yoga, running, basketball, futsal and tag rugby. Soon we will be having our active school’s week from the 1st to the 5th of April. We have many activities planned for the week. In conclusion, physical activity is very important because an active life is a better life! 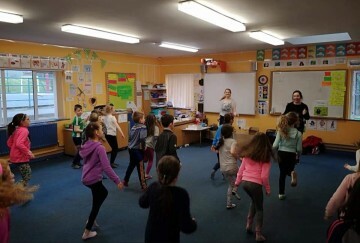 During Active Week Break Through Dance Company kindly made a visit to our school here in Inch. Laura Jane was the dance teacher who taught us all we learned that day. She taught us a dance from High School Musical. Each class got their chance to learn this dance with Laura Jane. 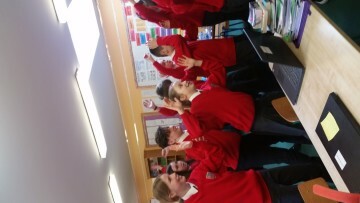 We went from Junior infants and Senior infants all the way up to fifth and sixth class. Each class had great fun! To begin with each class did a series of stretches to warm up our bodies. Then we started to put the different aspects of the dance together. After we had learned and perfected the dance we started to play a few games, such as musical statues! The classes were 30 minutes long each. After this many of the children were encouraged to try dancing. 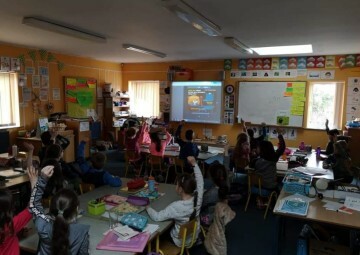 This was a great activity for active week and many of the students and even teachers enjoyed the class! This is a great way of keeping fit and getting your heart pumping. We are very grateful to Laura Jane and our teachers for giving us this new experience. We would like to say a big thank you to her for giving up her time to teach us. Hustle Fitness came in doing our active week on Thursday. 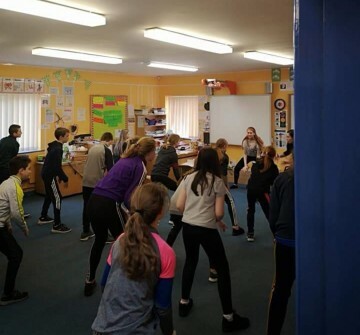 Each class got their own session with the trainers at Hustle Fitness whose names are Jess and Conor. Each session lasted 30 minutes. 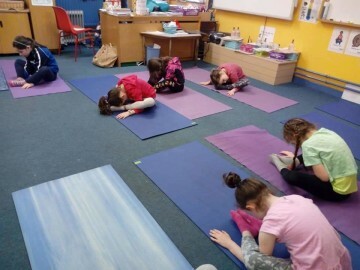 During this period of time, we played games such as who could hold the plank for the longest, who could pass the ball down the line quickest, which line could roll the ball under the bridge made by the children doing the hand plank. This challenged people a lot we also played a game where we ran around and the instructors called out a number and we had to do the exercise that was made clear to us before we started; these exercises consisted of lunges, plank, press ups and lastly squats. Last of all we split into groups and each group had a different colour bib. when we got these bibs the instructors called out a colour and that group was on in a big game of tag which included everybody in the classroom. Everybody really enjoyed this game. Hustle Fitness came in voluntarily to give each class their own exercise class. everybody really enjoyed the exercise class that was generously given to us by Hustle Fitness. During Active week we ran an Olympic Handball Tournament. This was a tournament for 1st class to 6th class. 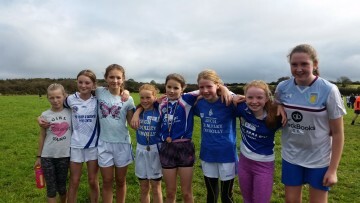 In this tournament the pupils were split into 7 teams of nine and one team of eight. The tournament was held at two o clock on Monday, Tuesday, Wednesday and Friday. The matches were played on our basketball court. It was ten minutes a side. Each team had six on with two subs off. The players changed every two minutes. The tournament started at the quarter final stage The winners of the quarter finals went into the semi-finals. Those winners went into the final. In the final was team 4 and Team 5. Team 5 were the winners of Olympic Handball. All teams played very well but there was only going to be one winner. Everyone took part and work as teams. On the winning team was Aoibhe, Sarah, Diarmaid, Sean K, Dylan K, Donnacha, Niamh, Joseph. The pupils from 1st to 6th who weren’t playing watched the matches. All classes and some parents came to watch the final. There was lots of support and great excitement threw out the week. Everyone enjoyed the tournament. The tournament went very well and everyone left the matches with smiles. P.A.W.S. Stands for Primary Aquatic Water Safety. This program teaches primary school children water safety at home, on the farm, and on the beach. P.A.W.S. teaches children all different types of ways to avoid water accidents including slurry tank safety, pond safety, and how to prevent accidents in water barrels. P.A.W.S. helps kids to understand that water can be fun , but always be careful. During active week each class did over an hour of P.A.W.S. to ensure that everyone understands how to keep safe in the water. During active week some parents kindly lead some activity’s voluntarily. 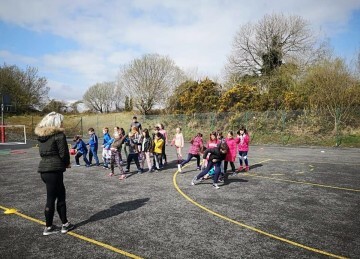 Ava McGuane’s mam, Annie did multi-skills with juniors, seniors and third class. Donal and James Kileen’s dad , James and Jamie Hasset’s dad, Jarlath helped with soccer by taking and coaching a team. Pa Gleeson helped by referring the sixth class vs teachers game. 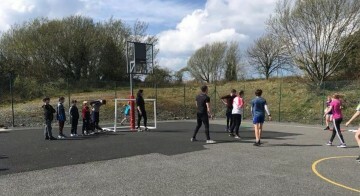 Some of the parents stayed and watched the sixth class vs teachers match. These are only some of the kind parents that donated their time to our active week . Soccer took place in Lees Road. James supervised one team and helped them through the competition. 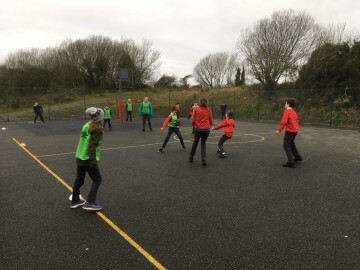 Soccer took place in Lees Road. 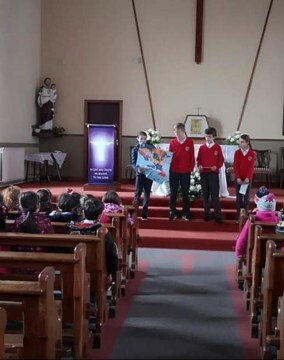 Jarlath supervised one team and helped them through the competition. 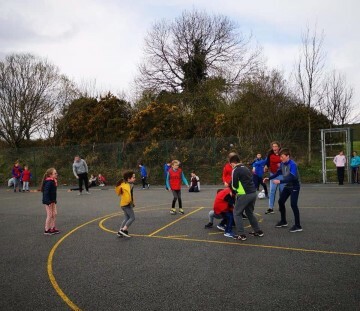 Sixth class vs teachers took place on the basketball pitch and he kindly refereed. 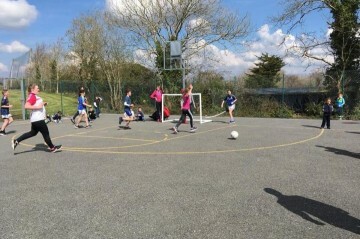 Last week, for active week we held a Teacher vs sixth class soccer match. It was played on the basketball court and many parents came to support both sides. The teachers really showed sixth class what they could do. Their starting line- up was well thought up with Mrs. Gleeson in goals, MS. Cahill in backs, Mr. McKenna and Mr. Grace in midfield and Susie in forwards. 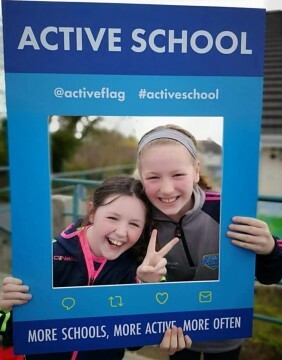 Whilst, sixth class’s starting line- up was Ava McGuane in goals, Sarah O’ Sullivan and Brian McArdle in backs, Joseph Casey in midfield and Judith Egan in forwards. Odhran Hayes, Gareth Harvey, James Vaughan, Evan Clancy and Riona Williams were rolled on and off as subs. The game was intense! An early goal scored by Mr. McKenna put the teachers in a 1-0 position. 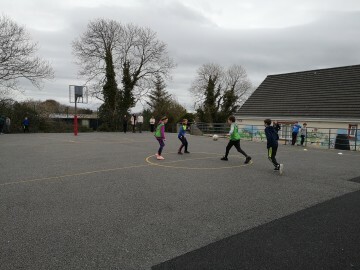 After a lot of hard work, 6th class got in a late goal by Judith Egan. This made the score 1-1. After the final whistle the match went to penalties! It was very hard to watch. The winning penalty was scored by Mr. McKenna. Sixth class were not happy with the results but were great sports men and women. After the penalties all the teachers shook hands with all of sixth class and everyone had great day! 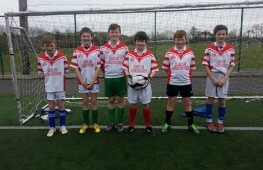 The Soccer Duos are when 6th Class pupils are paired with 3rd Class pupils and a 5th Class pupil with a 4th Class. Each duo played another duo in a game of World Cup Duos. Bobby McArdle and James Killeen took turns being the goalkeeper. The duos had to score a goal to get through to the next round. It kept going until we got to the final. If you do not score a goal in five minutes, the game goes to penalties. Whoever does not score is knocked-out. The games where very tough as each pair had different strengths and because of this the games sometimes went to penalties. Although some games where over very quickly but that’s not because the opposing pair were bad it was simply the other pair were just more experienced in soccer. In the end Joseph Casey and Chloe McArdle won the final.